CPR stands for Cardio Pulmonary Resuscitation, i.e. to help restart the heart (pulse) and lungs (breathing). When do we perform CPR? 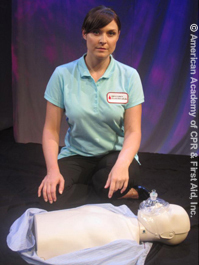 CPR is performed when a person stops breathing and/or the heart stops. Every year about 350,000 people suffer cardiac arrest, i.e. their heart stops. Sudden cardiac death is the most common cause of death in United States and Canada. If you know how to perform CPR, you may be able to save a life.